On the morning of May 20, 1980, a fire of unknown origin razed the Myers Ward at the Eventide Home for the aged on Slipe Pen road, Kingston 5. 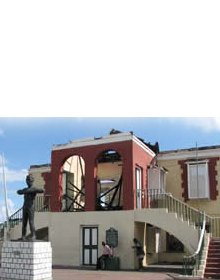 The Myers Ward was an old wooden building constructed during the late nineteenth century Jamaica, so it had quickly surrendered to the fire. About 153 old women, permanent residents of Eventide assigned to live on Myers Ward, lost their lives in the early morning blaze. The joint team of firefighters from Kingston and the neighboring parish of Saint Andrew managed to keep the fire from spreading to the rest of the Home.Afterwards they recovered 144 charred bodies from beneath the rubble. Myers Ward had been reduced to metal rods, zinc sheets and ashes. A few days later, two other women who had suffered severe burn injuries during the fire died at the Kingston Public Hospital on North Street, increasing the number of dead found to 146 persons. Myers Ward was home to about 211 elderly women when the fire broke out and only 58 of that number escaped alive. The seven women who were not found in the rubble after the fire remained missing and were eventually presumed dead. The loss caused by the fire was estimated at J$150,000. The Government agency responsible for the upkeep of the Home, The Kingston and Saint Andrew Corporation (KSAC), announced that whether Eventide was repaired or rebuilt at a new location it would be costly to the Government. One opinion on the cause of the fire argued that it was the result of political maneuvering during the final months leading up to the most violent general elections in Jamaica's recent history. There were in fact a number of reports to the police from persons living at the home that gunmen had entered the premises more than once, claiming they had come to kill the staff and inmates for reasons connected with their alleged political affiliations. Moreover, gunmen besieged the premises of the Home just six months after the fire and this time injured two persons. One of them, Mr. Harold Tefler, a meal van driver for the Home, was stabbed and then beaten while unloading the meal van. The other victim of this recent attack on the Home was a 63 year old female resident, Miss Vera Wynter. Miss Wynter was sitting on the veranda "taking in a little fresh air" she said, when the gunmen opened fire on the premises hitting her several times. Eventide had opened on July 1, 1870. It was built specifically for elderly women but eventually opened its doors to destitute, crippled and handicapped old men and children. In its first year of operation Eventide housed about 160 women and was maintained by the 'poor rates' of the KSAC. In 1943, following the labor riots of 1938, and the consequent struggle for universal adult suffrage, which was achieved in 1944, the resident population of Eventide grew to 968. By 1980, the year of the fire, the population numbered 700, a slight decrease. Of this number, 211 resided on Myers ward, all of them elderly women. The staff at the time numbered 180 and was led by Mr. David E. Dunkley, Master of the Home. Eventide had always been plagued with problems. These ranged from want of adequate funding, poor living conditions, underpaid and sometimes insufficiently trained staff, to vandalism and of course lack of security. A little after the mid 1970s, the Government began showing greater interest in addressing the deplorable conditions at the Home, but shortly after that, other crises of national importance took over the Government's attention, namely the declining economic situation. 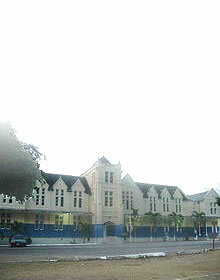 Consequently, Eventide was put aside until after the elections of 1980, after the fire. However, even then, none of the recommendations of the Technical Committee set up to suggest measures to restructure the Home were put into effect, and Eventide itself dropped out of existence somewhere in the mid 1980s. The Technical Committee,headed by Pat Anderson, the Director of Regional Planning in the National Planning Agency, had suggested a number of measures that would decentralize and restructure Eventide. One was that it should be turned into a multi-purpose Home to care for the aged as well as the disabled, chronically and terminally ill. This multi-purpose Home would have special programs developed for each of those groups. Another suggestion was that the wards should be replaced with "cottage-type units," which would encourage a more communal kind of environment, where residents could interact with each other instead of being relegated to "barracks-type quarters" like in an army camp or prison. Other recommendations dealt with specific areas in need of urgent attention, such as a security officer to man the entrance of the Home; a fence around the entire compound to discourage easy entry; bright lighting outside for better security at nights; toilet and laundry facilities built specifically for the handicapped and the infirm; vegetable and flower gardens to encourage outdoor activities; play areas for children; a pharmacy, clinic and sick bay; a new kitchen with modern facilities; a canteen suitable for general eating; a workshop; a morgue and a chapel. Following the mandate of the KSAC on June 17, 1980, the Technical Committee also suggested that the Home need not be relocated, but if that was to happen, the Edna Manley Children's Ward should be developed into a small home for mentally handicapped children. Probably the most progressive suggestion coming out of the Committee was the idea that the Ministry of Construction should initiate a policy of reserving special houses for the aged within Government housing schemes. This would reduce the pressure for accommodation on existing institution like the Eventide Home. The fire at Eventide was not the biggest in the history of Jamaica, but it took the most lives. The women who died in that fire were victims of a country trying to reposition its political identity. As was unfortunately common in small countries like Jamaica, this process of change was marred by much violence and bloodshed. None of the women at Eventide deserved the type of death they received, and along with the other sad events of 1980, the fire is indeed a significant part of our political history. 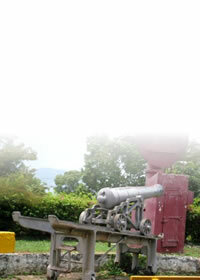 Recognizing this and its importance for the future course of Jamaican politics, then Prime Minister, Michael Manley, declared May 26, 1980 -- the day on which the Eventide women were laid to rest in a mass grave inside National Heroes Park (see photo above) -- a day of National Mourning for the country.